Family-School-Community ROCKING TOGETHER Winter Bash! 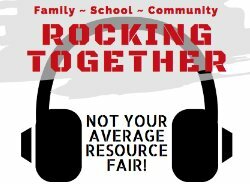 THIS IS NOT YOUR AVERAGE RESOURCE FAIR! The Rock Island-Milan School District and community partners through the Check and Connect Council are coming TOGETHER to provide resources and supports for school district families to get through the winter season! Information session topics include: Education | Health Care | Nutrition | Mental Health | Preventative Care | Safety. JOIN US! Participants receive FREE RAFFLE BASKET ENTRIES, FREE FOOD, BOOKS and WINTER KIT GIVEAWAYS (while supplies last! )!